ResMed is the leader in CPAP machines. The AirSense 10 is their latest machine that takes everything they have done well with their previous machines and improved upon them. I personally own and use this CPAP machine, and I think it's the best CPAP machine on the market; read further to see why. In this ResMed AirSense 10 review, I will provide you with all of the information you need to determine if this is the best CPAP machine for you. Probably the best feature of the ResMed AirSense is the ease of use. It might look complicated, but it really could not be easier. It takes very little time to set up this CPAP. For a machine that will be used everyday for years, it is very important for it to be simple, especially when your health depends on using it regularly. That’s not to say it doesn’t have many unique features. It’s just that those features are so intuitive, it doesn’t require much input from the user. It is really as simple as just putting your mask on. You don’t even need to set the pressure. You can give it a general setting with some room for change. For example, setting it for a range of 8-14. The machine will analyze when you are experiencing an event or change in breathing and will adjust the pressure accordingly. Of course, you can also set a specific air pressure to what your doctor has prescribed. Preparing for bed doesn't require a lot of time getting your CPAP machine ready. The less you have to do before bed, the better. With the SmartStart feature, all you have to do is put your mask on and, when you begin breathing, the machine will start working. All of your settings are saved, so it couldn’t be quicker to get comfortable and ready to sleep. If you find it difficult to sleep when you are at full pressure, then you will love the AutoRamp feature. If AutoRamp is enabled, the machine will start with a low air pressure setting when you put the mask on and start breathing. Then, it will gradually increase the pressure to the right level when you are asleep. You can provide a ramp time from 5 minutes to 45 minutes. The AirSense wants to make sure that you can fall asleep quickly. Blasting you with high air pressure right when you are trying to fall asleep might keep you awake longer. Lower air pressure can help you relax and fall asleep quickly. If you wake up during the night, however, it will continue with the same pressure as when you were asleep. Exhaling while using some CPAP machines is not alway the most comfortable feeling. When the pressure from the air coming into the mask stays the same, when you are either inhaling or exhaling, it feels like you are struggling to breathe. With the ResMed AirSense 10, the flow generator on the machine detects when you are beginning to exhale and drops the pressure slightly. You are able to exhale easily without feeling like you are swimming against a current. When you have a CPAP machine running and have a mask on your face, it’s even more important that the machine is as quiet and unassuming as possible. The less it can distract you, the better you will sleep. The ResMed AirSense is whisper quiet. It literally is the same decibel as someone whispering. In fact, the sound is so low that it almost acts like a white noise machine; this will help you get to sleep rather than keep you awake. I used to like having a fan on in the room for the steady noise, now I don’t need it thanks to my CPAP machine. You can use either a standard or heated hose with the AirSense. If you want to have your heated hose work with the humidifier, there is nothing to adjust or set. Just plug it in. The settings for the temperature of the humidifier can be set to automatic or manual. If it is automatic, the machine will determine the best level of humidity so you don’t have to think about it. If you think the automatic settings weren’t working the way you like, you can go into your settings on the control panel and adjust them. The two most important settings you can adjust include the temperature of air being delivered and the humidity level. Adjust these settings to avoid a "rain out" which happens when condensation starts to build up in your hose and your mask. This CPAP also has a pre-warm setting if you want to make sure the water in the humidifier chamber has been warmed up before you begin using the machine. That way, you aren’t breathing in cold air while you wait for it to warm up to temperature. As I stated earlier, a CPAP machine should be unobtrusive. You should be able to forget that it’s even there. This includes how much light it emits. Luckily, the AirSense has an ambient light sensor. If your bedroom light is on, the control panel will be bright so you can read it. When your bedroom light is off, it will dim itself so your room isn’t lit up. It will also turn off the screen once the machine is in use. 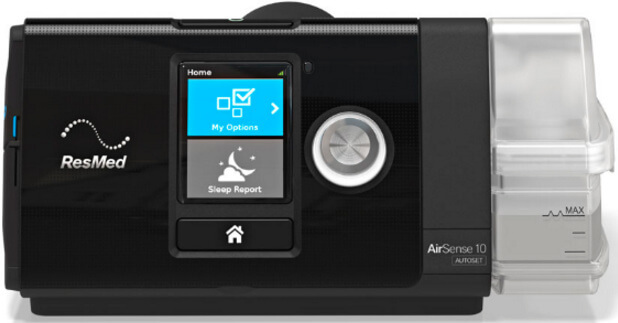 While there are other CPAP machines that were built primarily for travel, the AirSense 10 is still quite portable. The AirSense is small and lightweight enough to take with you when you travel. It also comes with a handy travel bag. In addition, it has an airplane mode like most smart devices such as your phone and tablet. This shuts off the wireless connection so it doesn’t conflict with airline regulations. Of course, it won’t relay any of your sleep data while you are flying. If you are traveling somewhere without power, there is a rechargeable CPAP machine battery that can be purchased separately. You should expect to get two full nights of battery power out of a single charge. There is a ResMed AirSense 10 For Her since it is understood that women have different needs than men when it comes to sleep apnea. This model has additional customizable pressure options specifically suited for females. To get the most out of your AirSense 10, I recommend the Climate Line Air Heated Tube. This CPAP hose has an electronic connection to the machine that allows it to control the air temperature being delivered to your mask, increasing your comfort. Do I need a prescription to buy a CPAP machine online? No, you do not need to get a prescription. Keep in mind that CPAP machines work most effectively when you have done a sleep study to determine what the optimal pressure settings are for you. Please consult your doctor if you have any concerns. Can I use it without the humidifier? Yes, the humidifier option can be unselected in the menu. You still need to have the humidifier chamber connected, though, as it is required for the machine to function properly. How do I clean this CPAP machine? The only part of the actual machine that needs to be cleaned on a regular basis is the water chamber. What I do is remove it every morning, rinse it briefly in the sink, and leave it opened and upside down on a paper towel. Once a month, you should use some dish soap with warm water, close it, shake it a bit, rinse it thoroughly, and let it dry. Click here for more detailed cleaning tips. How do I know if I should use the humidifier? The air pressure flowing into your mask can dry out your mouth and nasal passages. For some people, that is not an issue. For others, it can be quite uncomfortable. Try it out with various humidity settings and even with the humidifier off and see what works best for you. As you can see, the ResMed AirSense 10 is very customizable. The best way to find the settings that work for you is to just try them out. You would probably be fine with most of the settings on auto mode. That is the beauty of this CPAP machine; it doesn’t require much to set up. The machine will adjust according to the data it is getting from your breathing. However, if you feel that even on auto mode, the air is drying out your nose or mouth, you should increase the humidity level manually. That is easy enough to do using the control panel on the front. Press the dial, and you will access the menu. Scroll down to the humidifier setting and adjust the level. Adjusting it higher will give you more humidity, and adjusting it lower will decrease the humidity, making it drier. You may feel the temperature of the air is too cold or too hot. Again, that is an easy thing to remedy by using the control panel and finding the air temperature setting. The AirSense has a pre-warmer function that can be turned on before you use the machine. About 15 minutes before you go to bed, turn this setting on, and it will warm the water in the humidifier chamber to whatever temperature you prefer. There is an air filter in the machine that should be replaced every six months, at a minimum, according to ResMed. If you live in a dusty environment, it will probably be dirty and need to be replaced more frequently than six months. If you are checking it every month and it looks fine, then you know it can be done according to your user manual. If it is looking a little dirty around month three, make sure you replace it then. You can order these replacement filters from Amazon. Over time, the water chamber silicone will break down, and the chamber will need to be replaced. It is recommended you change this every six months but, in my opinion, as long as it stays clean and the silicone keeps a solid air seal, then it is fine. If you ever hear a leak coming from your machine, it is probably a broken silicone seal on your water chamber, and it will to be need replaced. You can buy a replacement water chamber on Amazon. If you are looking to purchase a new CPAP machine, I highly recommend that you give the ResMed AirSense 10 serious consideration. If you don't want to go through your insurance, you can purchase this online from Amazon. The machine has a 2-year warranty and should last for many years beyond that. As I previously mentioned, I own this machine and find it to be the best CPAP machine available. It has many features that make it highly customizable so you can experiment and find the settings that make you the most comfortable. While it isn't the greatest travel CPAP machine, it works extremely well for those who want to just leave it on their night stand. ResMed really has all the bases covered with this machine. From the ease of use to the wireless connectivity for instant analysis by your sleep care provider, there is not much that this machine fails to deliver. It is true that this machine costs more than some other CPAP machines on the market, but not by a huge margin. You get what you pay for in many cases, and this is no exception. I believe my health was worth the price which is why I am using the AirSense 10 myself. Deciding on a CPAP machine is not an easy task, so please ask me any questions that you have about the ResMed AirSense 10 that this review did not cover. I am happy to share more about my experience with it. I hope that you enjoyed this ResMed AirSense 10 review. Cheers to getting the restful sleep and good health that comes with it, no matter what machine you end up buying. My Resmed airsense 10 has gotten to be such a noise problem that my wife often sleeps in another bedroom to avoid the sound. Sorry you’re having troubles with the noise! It’s possible you need to replace your filters (you can find cheap replacements here: http://amzn.to/2idrwJL) Also, you might be in need of a new hose and/or a new water chamber as the seals might not be tight. Here’s a new water chamber – http://amzn.to/2i9DRPg and here’s a new hose – http://amzn.to/2jDZKGQ Let me know if you need additional help! Did th noise increase as time went by?